Some tips that may help make your travels a little easier! I've had the opportunity to travel a lot since last July. I’ve done more traveling this year than I have within the last six years combined, and it has been a hell of a lot of fun learning how to travel on my own. My parents always emphasized the importance of travel so my siblings and I could see how people live in other parts of the world. Further, they always said hard work warrants time to relax and recharge in the form of vacation and travel. As my siblings and I grew older, and expenses and schedules grew tighter and fuller, our traveling as a family hasn’t been as often as we all may like it to be. Nonetheless, as I’ve grown older, I’ve begun traveling a lot on my own, and financing a lot of my own trips. Most of the time, I am traveling to visit my boyfriend who is serving in the army. But recently, I’ve also been traveling a lot for school and dance. Since the New Year, I’ve been fortunate enough to visit my boyfriend three times! Two of these three trips has basically forced me to learn how to navigate airports by myself since I always travel to see him alone. I live in New Jersey, and it is more convenient to fly out of Newark International Airport (EWR), and if you know NJ airports, EWR is HUGE. One of these trips I even had to drive myself there, park, take the air train to the terminal, and then proceed to find the correct security level for the airline, and find my gate. It was really nerve wracking at first, but since I’ve done this journey to see him a few times now, I think I’ve finally nailed navigating the airport by myself. If you are someone who longs to travel, chances are you will have to learn how to navigate an airport by yourself at some point. Here are 10 tips on how to navigate an airport by yourself! 1. 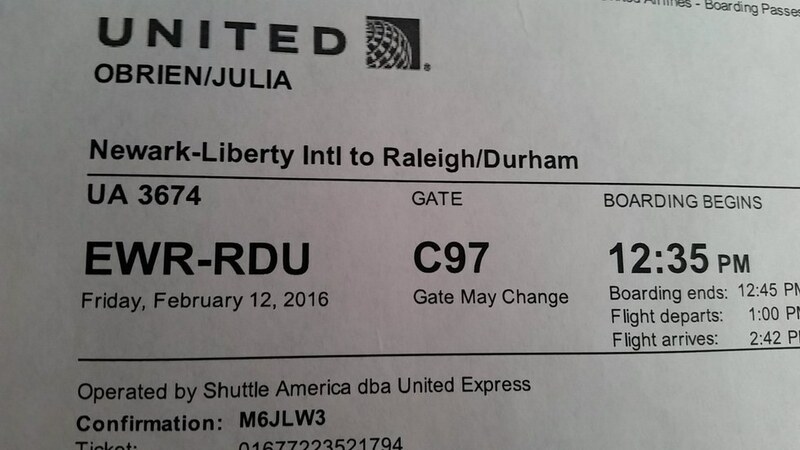 Print your boarding pass out at home the night before. Almost all airlines have online check-in so you don’t have to spend time at the check-in kiosks at the airport printing your boarding pass. It saves a lot of time depending on what time of the day and time of the month/year you are traveling! 2. If you are driving yourself to the airport, read the highway signs. They are all clearly marked and labeled, but the roadways may be confusing, especially if you aren’t familiar with them yet. This is probably not a good time to be jamming to Meghan Trainor – lower the volume and focus on the signs! 3. At least in the case of Newark airport, and Atlanta airport, the air train/air shuttle only has a time gap of about 1-3 minutes. If you miss one shuttle, there is probably another one coming shortly after. Don’t panic (unless you’re flight is late and you’re left sprinting through Atlanta airport trying to find your connecting flight’s gate, not understanding the terminals aren’t connected, and you HAVE to take a train/shuttle). 4. All major airports do not have connecting terminals. Sometimes connecting flights are late, and that 4 hour layover you thought you had just turned into a mad dash to your next gate (see #3). Also take note that not all airports will call their “air train” an “air train” – read the signs inside the terminals carefully! 5. It will help if you read the TSA guidelines for the specific airline you are traveling on before you travel. If you’re like me and only travel with carry-ons, different airlines have different regulations for carry-on size. If you’re bringing a carry-on, also be wary of the amount of liquids in your bag, and electronics. 6. Once you make it to security, make sure you have your boarding pass and state-issued I.D. out. This will be marked, but do it as quickly as you can so you don’t hold up the line. Security lines can be very time consuming if you’re not prepared. 7. After you’re through security, grab your belongings and make sure you have everything. Then follow the signs (again, reading them carefully) to your appropriate gate. 8. The last four flight’s I’ve been on have been delayed in some way. Check the big monitors posted throughout the airport terminals. You can locate your flight, check to see if the flight is on time, and see if your gate changed. Definitely do this because just recently, the flight I was on changed gates at the last minute because the plane was having major maintenance issues! 9. Be cautious with who you interact with, but also be open to friendly conversations! I’ve had some great conversations with some people I’ve met at my airport gate. On the other hand, I’ve also met some creepy people, so be aware of your surroundings. On my last flight, I met a woman who was in her mid-thirties and from Trinidad, and we chatted the entire hour and a half long ride to our destination. She had traveled all over the world, and it was so fun exchanging travel stories with someone who was as cultured as she was. 10. Arrive early, breathe, and get excited! Part of the adventure of traveling by yourself is the stress that comes along with it. Don’t look at flight delays or travel obstacles as joy-killers. It is part of the experience!